The big self-unloader, a member of the Canada Steamship Lines fleet, started long term lay-up on December 23, l996. Not too long ago, this was the largest self-unloader on the Great Lakes. The hull was launched at Collingwood on July 23, l964, and christened at Midland on March 24, l965. The 730 foot long by 75 foot wide vessel was powered by a 9,900 horsepower Canadian General Electric steam turbine engine. TARANTAU made the news on several occasions over the years. She closed the 1971 navigation season along the Welland Canal January 7, 1972, completing 136 transits of the waterway for the year. She participated in the official opening ceremony of the Welland By-Pass July 14, l973, and was the first ship of the season in the Welland Canal March 30, l978. 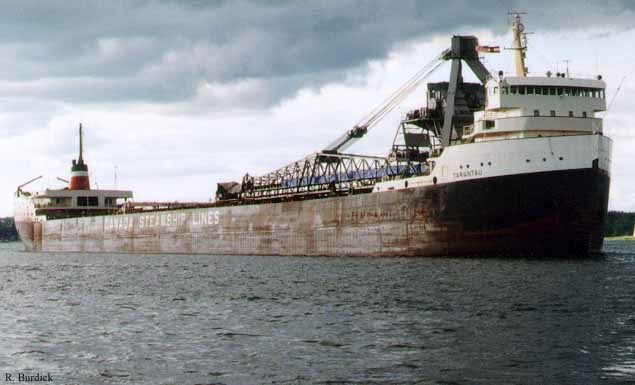 TARANTAU handled 43 cargoes in her final season of 1996. These included ore - 26, stone - 11, coal - 3, scrap - 1, coke - 1 and slag - 1. She traveled from Duluth to the Gulf of St. Lawrence and called at twenty-two different ports. In late October 1999 the Tarantau was towed from her Cherry Street slip in Toronto. The vessel was towed across Lake Ontario for International Marine Salvage at Port Colborne, Ontario. The vessel was scrapped at the yard over the next few years. If you enjoyed this feature Click here for more by Skip Gillham.